CAT 2018 Application Form: Common Admission Test (CAT) is one of those competitive entrance examination which is conducted for those candidates seeking admission into MBA and other management courses. This national level examination is conducted every year by the IIMS on regular basis for admission to 19 Indian Institute of Management (IIMs) and various B-schools located across the country. This year the examination is conducted by IIM, Lucknow. The authority has already released the CAT Notification 2018 on July and therefore candidates who wish to pursue MBA programs from IIMs or top management colleges in the country can apply for the entrance soon. The process of filling the CAT Application Form 2018 is going to be started from August and will be available till September. Therefore in regards to more precise information on admission, CAT Exam Date etc go through the article below. The exam control authority of Common Admission Test (CAT) has released the notification in regards to CAT 2018 which is going to be conducted on November 2018 in two sessions. Therefore interested and eligible candidates must soon complete the process of CAT Registration 2018 date. Through the CAT Admission Process, the candidates will be offered admission into 20 IIMS and in more than 150 management schools across the country. 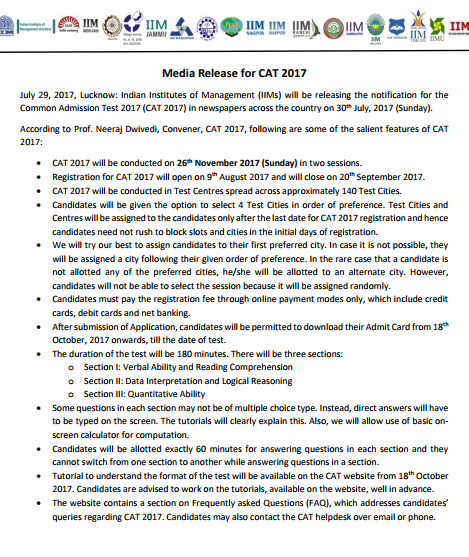 The examination is going to be conducted on 26th November and thus this article will familiarize the candidate with CAT Eligibility and other necessary details. All the candidates who are seeking admission for management courses in IIMS and the top ranking colleges must go through below-mentioned points to complete the registration. The registration is going to commence from 9th August and after the competition of registration, IIM will send the login credentials to candidates via SMS and email. After receiving the login credentials, the candidates have to log into the application window and fill up the CAT Online Application Form 2018 in the prescribed format. Candidates must upload scanned copy of their signature and photograph. Lastly, candidates need to make payment of application fee and complete the process. Payment can be done via net banking, credit card (Visa/Master/American Express)/ Debit card (Visa/Master). Candidates must possess bachelor’s degree with 50% marks (45% for SC/ST/PWD). If the candidate has obtained marks are in the form of CGPA then it would be converted to percentage marks based on the procedure certified by the university/ institution from where the candidate has passed his/her bachelor degree. Final Year candidates of bachelors degree whose results are awaiting are also eligible to apply for CAT. 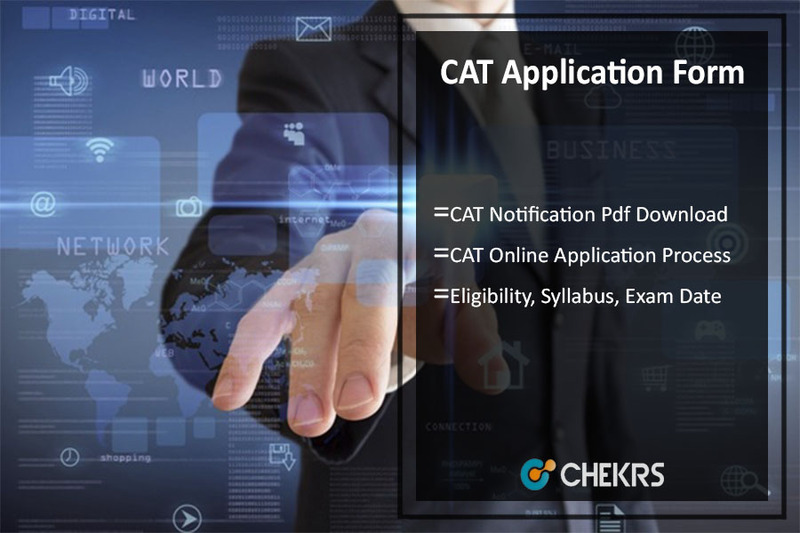 CAT is a computer based examination conducted for a duration of three hours carrying 100 objective type questions which include multiple choice and non-multiple choice questions. The number of questions in Verbal and Reading Comprehension and Quantitative Ability sections is same, i.e. 34, whereas the number of questions in Data Interpretation & Logical Reasoning section is 32. Below we have discussed the IIMCAT Exam Pattern 2018 in a precise format. The candidates will receive 3 marks for every correct answer and minus 1 mark for each incorrect response. No marks will be provided or deducted for the unattempted question. On the basis of the cut-off marks, IIMS and all other B Schools shortlists the candidates. All the shortlisted candidates are further called for Personal Interview (PI), Group Discussion (GD) and Written Ability Test (WAT). The CAT Admission Procedure will be done on the basis of overall score secured by the candidate in GD, PI and WAT. Apart from this the academic performance and work experience of the candidate is also taken into consideration. However, the selection process varies from B-schools to B-schools. CAT 2018 Admit Card will be released by the exam conducting authority on October 2018. Therefore all the CAT aspirants must download it and furnish it as the entry ticket at the examination center. Apart from this, a valid identity proof is also needed on the day of examination. 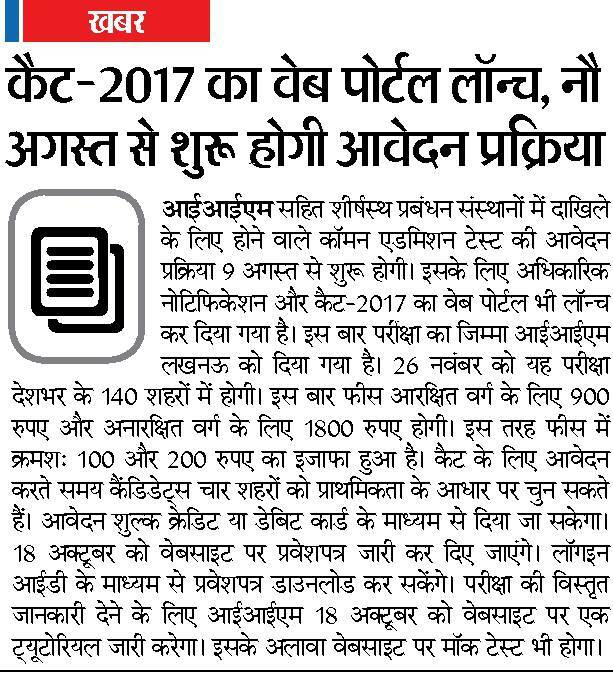 CAT 2018 Result will be declared in the tentatively in the month of January 2018. Thus the candidates can check their result through the official portal by providing details of their valid user ID and password. All the aspirants of CAT 2018 can access the CAT Scorecard 2018 on the same day of the result announcement. The score card will be valid for a period of one year. Candidates can download it by logging into the portal. The IIMS will release their own CAT Cut off marks for obtaining admission. However, apart from obtaining the cut off marks, the past academic record, work experience also matters for admission purpose. Below you can check the average cut-off marks for IIMs. Common Admission Test (CAT) is going to be conducted on November 2018. The registration will be started in the month of august and the CAT Admit Card will be available in the month of October. For the latest updates stay tuned to our portal. Incase of any feedback place your comments below.